Food allergies. Fast food. 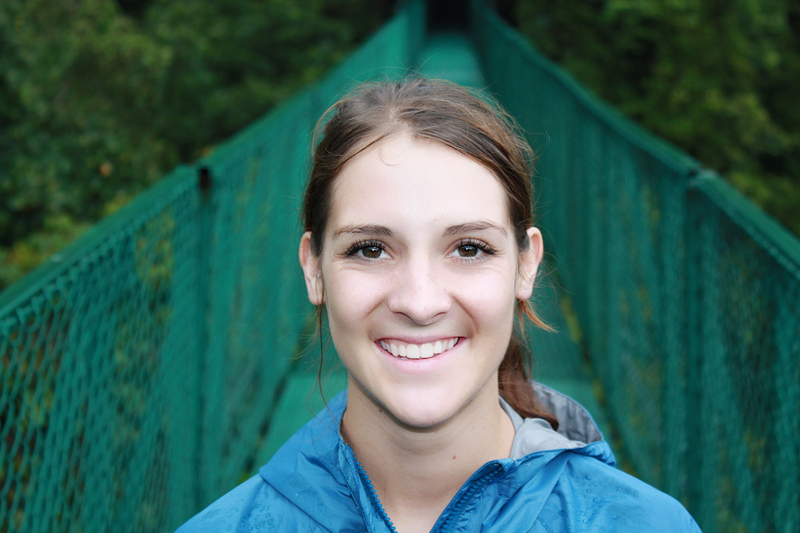 Digestive tract issues. Sickness. We’ve all been plagued by an upset stomach at one point or another, and fixing the problem can be frustrating. 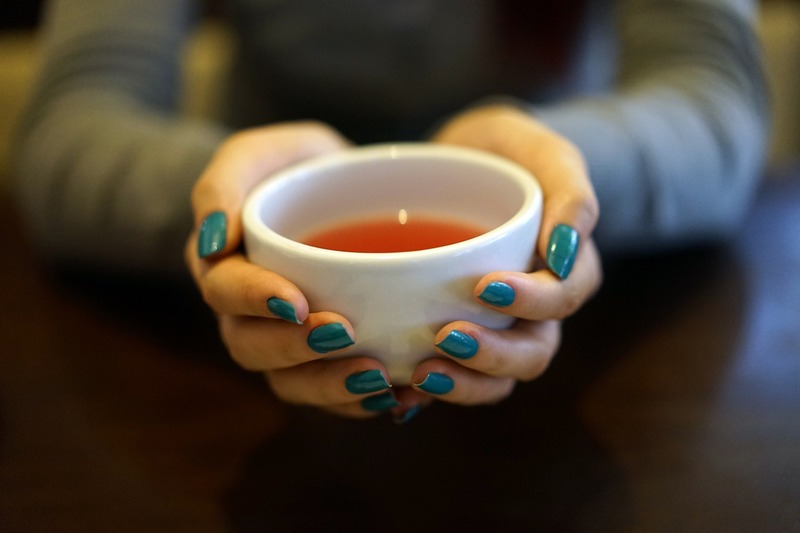 The best solution is often pinpointing the root cause, but if you need a quick fix or something that will alleviate pain in the meantime, a warm cup of tea is here to save the day. There are several different types of tea that can help settle an upset stomach, and with an array of flavors from sweet and floral to pungent and sharp, it tastes great in the process. 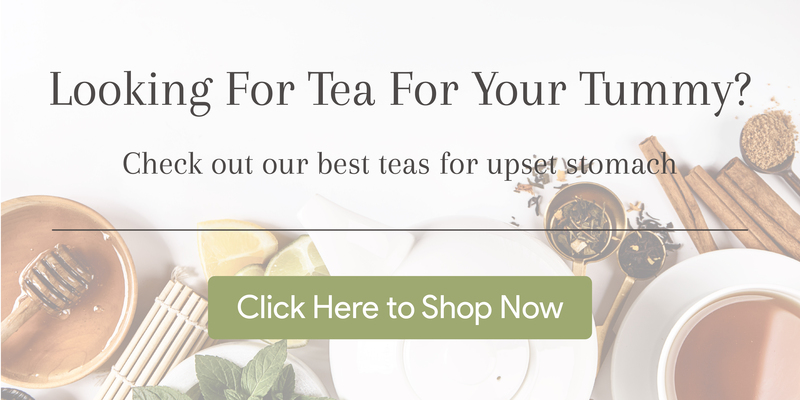 To help you feel better, we've put together a list of the best teas to calm your stomach and temper painful symptoms. 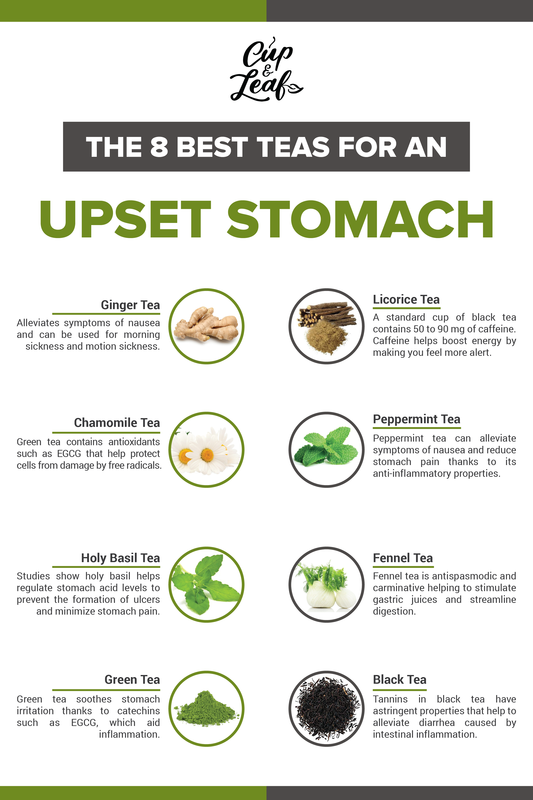 And if you want to get some for yourself, we have a collection of the best teas for your tummy right here. Reduce nausea and streamline digestion with our Thai Ginger Tea. Ginger tea has been used for thousands of years as a cure for nausea and digestive problems. It offers a variety of health benefits and healing compounds to alleviate upset stomach. Many people reach for the ginger ale when feeling symptoms of stomach pain or nausea, but ginger tea contains higher concentrations of the compounds that alleviate these digestive issues; making it the better choice for feeling better faster. This tea is made using fresh ginger root and packs a punch when it comes to healing symptoms of upset stomach. Ginger is a natural remedy for nausea and is often used to treat morning sickness in pregnant women and motion sickness caused by planes and boats. In fact, a Thai study examined pregnant women with symptoms of morning sickness and found that 28 out of the 32 individuals saw an improvement in nausea when given a daily dose of 1 milligram of ginger root (1). As a rule of thumb, one cup of ginger tea contains about 250 milligrams of ginger so aim to drink two to four cups of this tea to alleviate feelings of nausea. 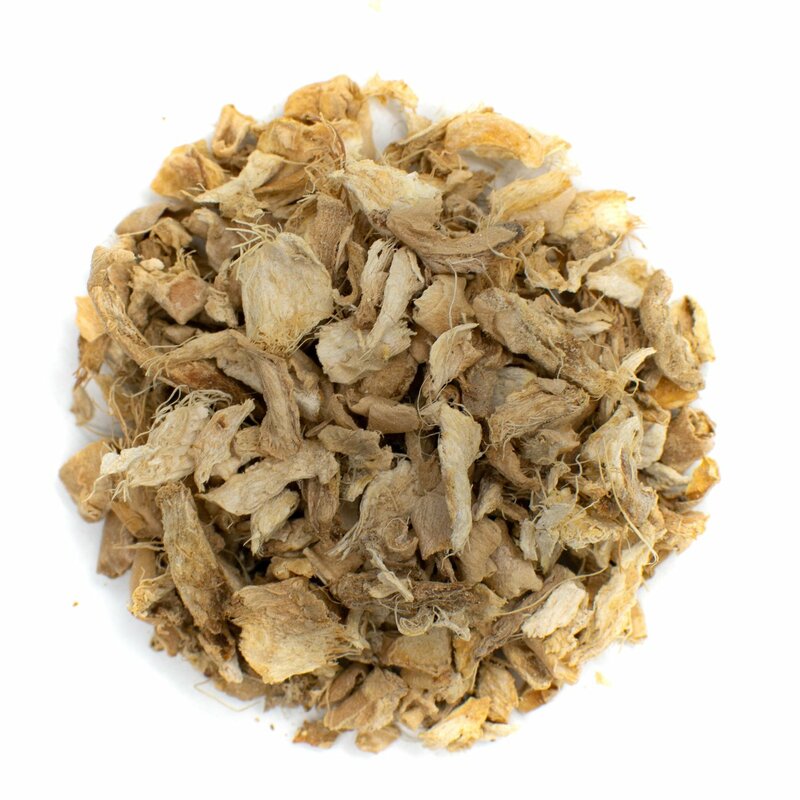 Soothe irritated stomach lining and decrease pain with our Licorice Root Tea. Licorice tea has a potent flavor that is often an acquired taste. It’s made from licorice root, which is native to Europe and Asia and derived from the plant scientifically known as Glycyrrihiza glabra. 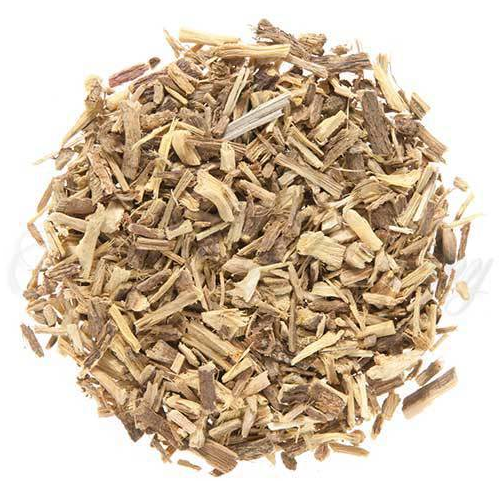 Used extensively by the Egyptians and in China as part of traditional medicine, licorice root tea not only soothes your stomach, but can also help to repair and restore the stomach lining. In a study published in Phytotherapy Research, researchers found that licorice root can inhibit the growth of the bacteria H. pylori, which is known to cause peptic ulcers. The anti-inflammatory properties of licorice tea help to soothe and alleviate pain in the gut, while chemical compounds help to rebuild the stomach lining, furthering gut health (2). This tea is a good choice if you suffer from stomach ulcers or other conditions that deteriorate the lining of your stomach. To consume, simply add 1 to 5 grams of the licorice root to boiling water. Drink three times per day, preferable before each meal for the best results. Licorice tea can be consumed daily for up to one week. After that, you should take a break from licorice root for two to three weeks before consuming again to avoid side effects including headaches and heart problems. 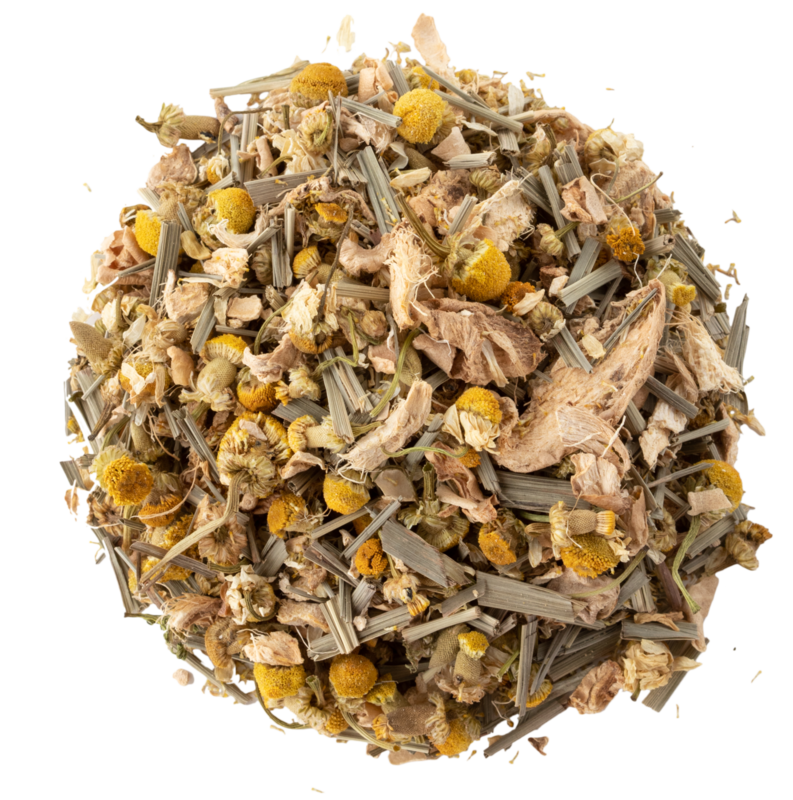 Soothe stomach pain, relieve gas, and calm cramps with our Egyptian Chamomile Tea. 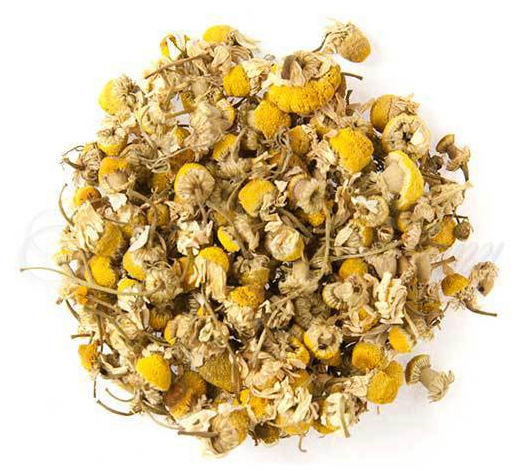 Chamomile tea is made using the buds of chamomile flowers. It’s known worldwide as a soothing, relaxing brew and one of the best home remedies for abdominal pain. Chamomile tea offers carminative properties, which help to reduce feelings of gas and bloating that can cause upset stomach. 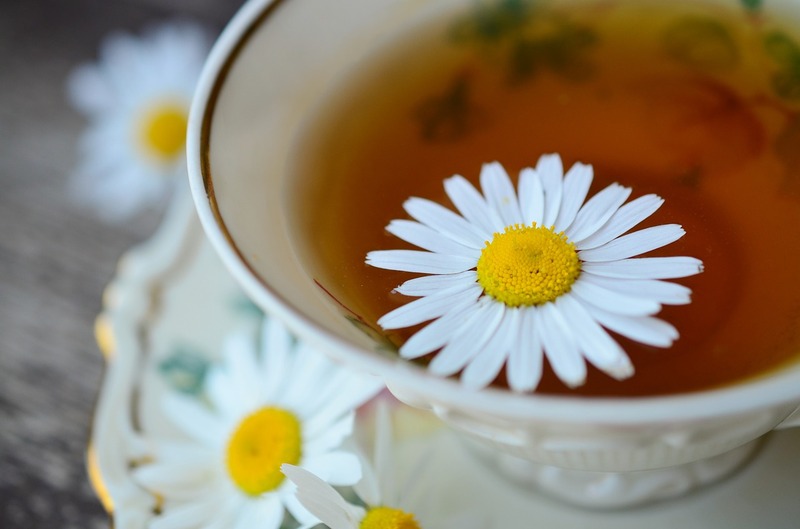 Chamomile tea reduces abdominal gas, which alleviates sensations of pain caused by stomach cramps. This tea also contains anti-inflammatory properties that can help soothe stomach conditions including irritable bowel syndrome. A 2006 scientific review found that chamomile tea lowered the production of gastric acid, which can lead to acid reflux disease when present in excessive amounts. Stress often exacerbates acid reflux along with other gastroesophageal diseases. Chamomile tea offers a natural calming effect, which can help reduce stress and further soothe an upset stomach (3). Our Peppermint Tea can help relieve cramps, stomach pain, and nausea. Peppermint tea has been an integral part of alternative medicine for centuries. The leaves help to alleviate pain associated with menstrual cramps and nausea — it’s one of the best teas to settle your stomach. Peppermint has been shown to inhibit pain receptors originating in the colon that lead to severe pain in the stomach muscles (4). The best part about peppermint tea is that you can easily grow these leaves right in your own kitchen to soothe a stomach ache. Peppermint tea is a hardy, fast-growing crop that grows well in most climates. Simply harvest a few leaves, add to a tea ball and combine in a tea mug with hot water. Let steep for 2 to 5 minutes, tasting every 30 seconds for your desired flavor. One thing to note with peppermint tea: It's best to avoid it if you have acid reflux issues as it can result in negative side effects. While this tea is great for alleviating stomach discomfort associated with pain, it also relaxes the muscle that prevents stomach bile from entering the esophagus, making heartburn worse. Holy Basil tea is not made with the same type of basil that you put on top of your pizza. Instead, holy basil tea is made from the Ocimum tenuflorum plant and known commonly as tulsi tea. This tea is native to Southeast Asia and is used widely in Indian medicine and Ayurveda. Studies have shown holy basil tea offers the ability to decrease stomach acid, and increase and extend the life of mucus cells — surface cells that line the digestive tract and protect it from disease. These studies also showed that holy basil leaves can reduce the presence of stomach ulcers, which can cause severe discomfort and disruption in the digestive system (5). To use tulsi tea to eliminate ulcers and decrease pain, brew tea using 2 to 3 teaspoons of holy basil leaves per 8-ounce cup. Allow the leaves to steep for 5 to 6 minutes before straining and consuming. Avoid adding sugar or other flavorings to tulsi tea, which can aggravate stomach pain and ulcers. 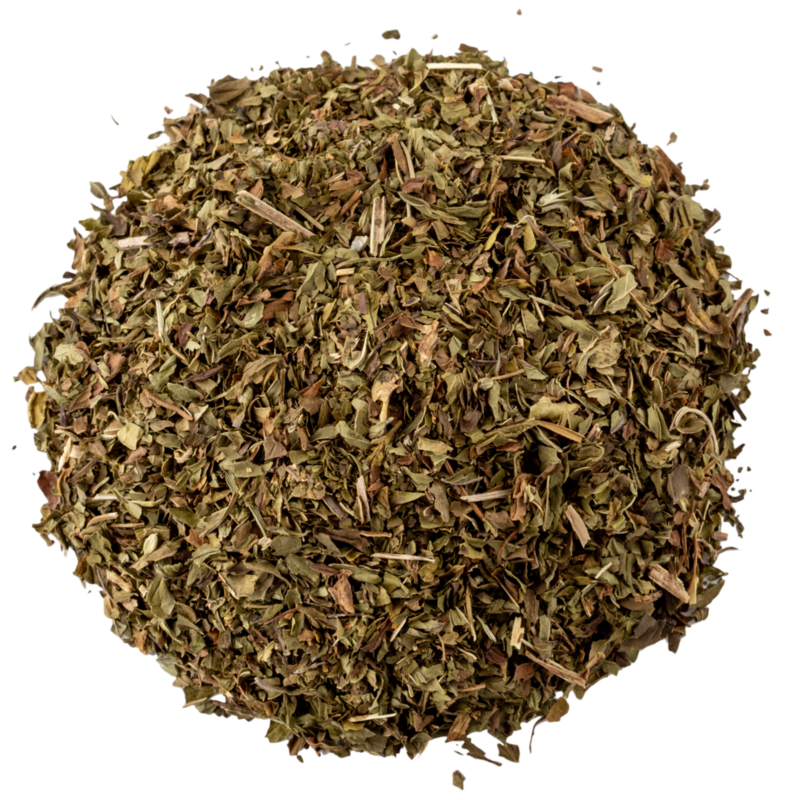 Fennel tea is made using the fennel seeds of the Foeniculum vulgare plant. The ancient Romans and Greeks believed fennel offered increased strength and health that could provide a longer life. Researchers have found that fennel seeds and fennel tea can help to stimulate the flow of gastric juices and reduce pain thanks to antispasmodic and carminative properties. Chinese medicine has used fennel tea to treat gastroenteritis, indigestion and hernias for centuries (6). Scientists think fennel tea works to reduce gas and bloating, which can lead to stomach pain and chronic conditions such as colic in babies. To reap the stomach-soothing effects of fennel tea, use 1 to 1 1/2 teaspoons of fennel seeds in tea each day. 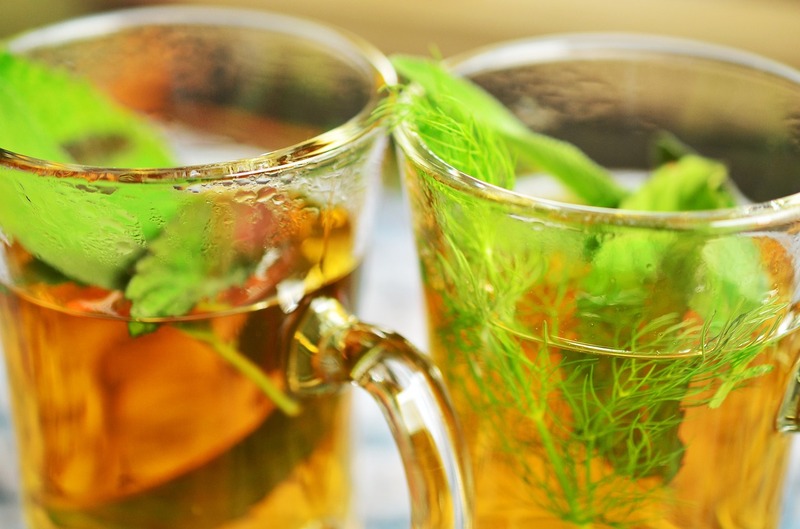 Fennel tea is considered generally safe, but make sure to ask a healthcare professional before giving it to infants or when consuming while breastfeeding. Try our Happy Tummy Tea—a blend of chamomile, lemongrass, and ginger—to heal upset stomach fast. Green tea is a true tea that is widely researched for its health benefits. One study published in the European Journal of Pharmacology found that regular consumption of green tea is one of the best ways to prevent gastrointestinal disorders in the first place. Catechins in green tea are easily absorbed in the intestines and can accelerate reduction of fat deposits and increase metabolism, which can aid in a host of digestive problems. Green tea can also help to stimulate the production of gastric juices including bile, which can help to break down food more efficiently leading to fewer incidences of bloating and gas (7). Research has shown that green tea can help to alleviate colitis and chronic gastritis, two diseases caused by inflammation and irritation in the stomach that can affect digestion. Green tea contains catechins including EGCG, which help to reduce inflammation and alleviate symptoms of pain (8). We recommend consuming 2 to 3 cups of green tea per day to help improve digestion. Make sure to drink green tea after each meal and not on an empty stomach as this can actually increase stomach problems. Green tea contains naturally occurring caffeine just like black tea, so limit consumption of this tea before bed to prevent insomnia. Black tea can help to relieve an upset stomach and diarrhea thanks to the presence of tannins, which have an astringent effect on the lining of the intestines. Diarrhea occurs when the intestinal lining is inflamed and black tea reduces this inflammation to help get your digestive system back on track. In a randomized study on patients from 2 to 12 years of age, black tea effectively managed diarrhea that was not caused by bacteria. After 24 hours, patients who received black tea demonstrated significant improvement in diarrhea symptoms compared to the control group (9). Black tea is a true tea that contains naturally occurring caffeine so it's best to avoid drinking this healthy stomach brew before bed so you can still sleep well. Aim for 1 or 2 cups throughout the day depending on your caffeine tolerance. Many teas soothe symptoms of nausea, pain and excess gas while treating chronic diseases such as acid reflux and chronic gastritis. Whether you want to cure nausea in a hurry or treat and prevent stomach ulcers, there's a tea for you. 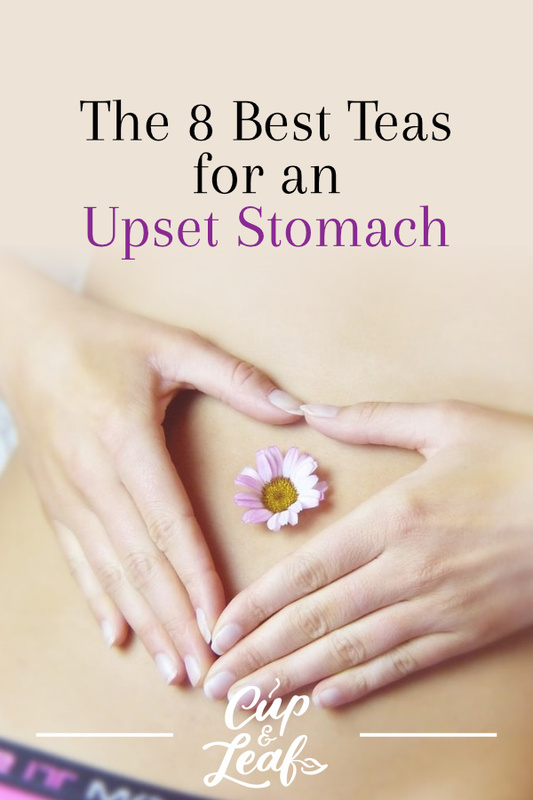 Keep this guide on hand so you know exactly which brew to grab to heal your upset stomach. And if you want to get one of these happy tummy teas for yourself, be sure to check out our favorites here.